Dying cotton fabric with watercolor paints is a quick, easy, and fun project. The watercolor paints will give the fabric a unique look not possible with any other kind of paint or dye. Once the fabric is dyed, it will be suitable for any number of sewing projects, or you may choose to simply display the fabric. Lay the cotton fabric on a flat piece of plywood or on another even work surface which you will not mind getting paint on it, should the paint drain through the fabric. Mix each watercolor paint with enough water in a bowl to give the paint the richness of color you desire. Use a large, round brush to apply a wash, or strokes, of paint to the fabric in a pattern of your choosing. Long strokes work best. Spray an even mist of water from the spray bottle onto the fresh paint, allowing it to soak and spread through the fibers of the fabric. 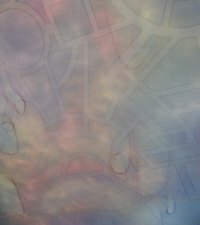 This allows for the creation of the unique watercolor effect. Repeat the process with the different paint colors until you have covered the fabric to your satisfaction. Remember, more water sprayed on the material means that the paint will spread more and soak throughout the fabric. Use the blow dryer to dry the paint. Allow the fabric to sit undisturbed for 24 hours before using, in order to insure that it is fully dry. Wash the cotton fabric first to allow it to shrink and to remove any sizing left over from the production of the fabric. After applying a wash of paint, you can use the blow dryer to prevent the paint from spreading beyond where you wish it to. Watercolor paints on cotton are not color-fast. Do not launder watercolor-dyed fabrics. Craftster: Watercolor Print Fabric--How to Dye? Can You Dye Fabric With Food Coloring?